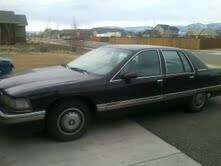 Found on Montana Craigslist: Lemons is for B-Body Edition. 93 BUICK RUNS GREAT, BUT NOT SO PRETTY. SHE HAS BEEN WELL CARED FOR BUT THE YEARS SHOW. NEW WINDSHIELD, NEW STARTER, FULL TANK OF GAS. TRUNK BIG ENOUGH TO HOLD 8 KIDS. HAHA. OLD GIRL DRIVES LIKE A DREAM. SHE HAS 333,000 MILES ON HER. USED HER AS A WORK COMUTER BUT NO LONGER NEED HER. SHE STILL GETS AROUND 20+MPG. CALL 209-3NINE SEVEN 5, THANKS KARL.